The team at UPM Conveyors recently worked on updating the production system for Rutland Plastics, a private company based in Oakham that operates moulding machines ranging from 150 tonne to 1700 tonne. The company has a 6600 sq ft factory floor and a turnover over in excess of £10 million. They approached UPM to achieve unattended production on a Krauss Maffei KM150. 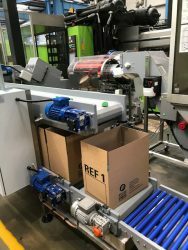 UPM provided a turnkey solution requiring 8 belt conveyors to allow automatic product divert for QC inspection; ferrous/non-ferrous metal detection; product cooling; parts separation and box filling with a capacity of 8 full; 8 empty and 1 filling. Metal detection is based on UPM inserting a search coil under the inclined section of the Swan Neck in the well of the machine. When a foreign body is detected it will energise an audio-visual alarm and stop the belt conveyor, allowing an operator to check and remove the contamination. This process does not affect the moulding machine cycle as products continue to be produced and accumulated on the conveyor until the operator has reset to start again. Product cooling is necessary to avoid any deformation to the mouldings which are produced in PP on multi-cavity tools ranging from 8-16 impressions mould and 4 sprues with a section thickness of 5 to 15mm. UPM fitted a cooling tunnel with high flow air fans to reduce the temperature from 80oc to 20oc. For parts separation, the system works via a roller drum with central adjustment for the gap to allow ease of changing so the sprues exit onto another swan neck for transfer to a granulator and mouldings discharge. This then goes to a third swan neck for conveying to the box filling station. The box filling station by UPM is a two tier construction and was designed to accommodate 8 full boxes; 8 empty and 1 filling with the box located onto a weigh scale to count by weight which achieves an extremely high level of accuracy. On achieving the correct pre-weight/count the overhead conveyor will stop; the full box is indexed off and an empty box brought onto the weight scale which initiates the overhead conveyor to start again repeating the cycle. When all boxes are full a sensor will energise an audible /visual alarm to alert an operator. To learn more about UPM, please read about us and get in touch if you have a conveyor system which needs to be built, designed or updated.